Sweater Tights: Thumbs up or down? 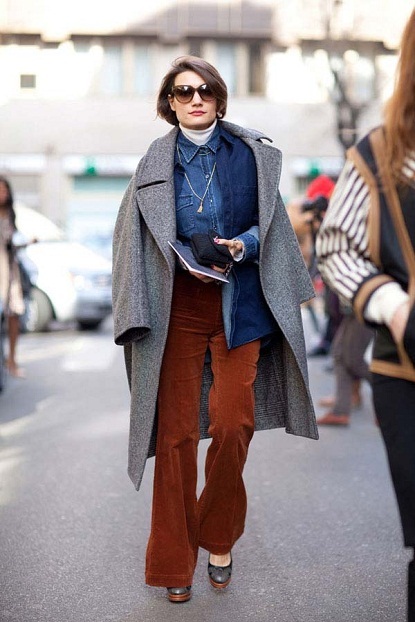 Autumn Trend: To Oversize or Not To Oversize? It All Comes Back To Food! Statement Knits: Thumbs up or down? Maddie all ready for Halloween! How do you feel about flying? Twiggy Lashes: Thumbs up or down? 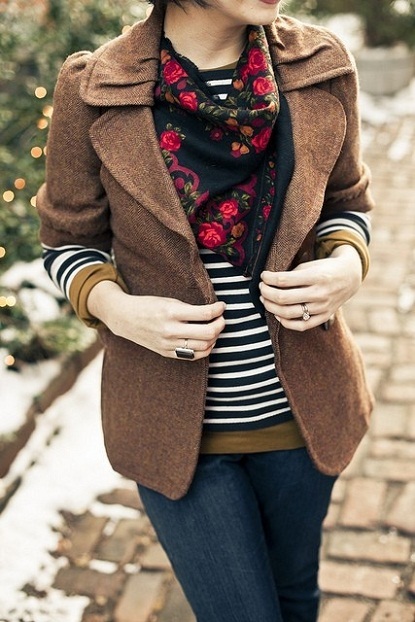 - Always start with a blouse or button down, then add a cardigan or a pullover and top it off with a jacket or a coat. For winter or when it gets really cold you can also add a tee as a base layer and then put the blouse, sweater, coat on top of that. - Your outfit can not be complete without a scarf. Fun fact: Gabrielle said that French ladies always wear scarves and the only place you can spot them without it is on the beach. Ha! - Most of the layers are classic colours like brown, black, navy, so to add a pop of colour French women usually wear a bolder scarf. Good idea, don’t you think? - Also, she mentioned that the basics layers are meant to be worn frequently which will give you a great base for the rest of the outfit + the bolder colour scarf. P.S: Plus a few tips on texture mix for your layers. P.P.S: Remember this girl? She definitely has it all figured out! I would love to layer but I always come out looking like a football player. I just can't ever seem to pull it off as wonderfully as these ladies do. I swear that in a past life, I was French! I only wear neutrals and use the scarf for the pop of color! Love that they only don't wear on the beach. So chic! Oh boy, Maria! So true, I read this morning that you guys are still having summer in LA. Enjoy the sunshine. layering, so tricky. they make it seem so easy, but i always end up looking bulky. hopefully these tops will help. Haha, Amy! You so should fly over. We have tons of crisp air right now:) Btw: The whole layering thing is pretty tricky but with those simple tip it should work great! Promise. That is so AWESOME, Christin!!! So French - love. Gah, this post is great and it makes me wish that it wasn't over 90 degrees here in California! I need me some fall! I love, love layering Diana. These are perfect examples plus your tips are wonderful! I'm taking new tips, though like the awesome ones you found! Oh please tell me about the top photo - love it completely -where to find the fur neck warmer?? The great hat?? My favorite combination...neutrals + neutrals + neutrals...may be blue...and a punch of red...not too risky, ah? So inspiring I love it. Amore! I though about creating a 'the art of layering' post, but obviously, after this one, I have nothing else to say...AMAZING! Besos! Inés, sounds totally beautiful, sweetie! Gorgeous looks and great post! I love French style! Nice! love this guide and will definitely be referring back to it! Been layering since I was a teen. I even get excited, when I look back on, when I was 12 and no one in my area was layering, I was having some unique fun. I do adore all the tips. These are definitely, lovely. Excited about layering and I've already bought several scarfs. The coat is from a Canadian brand but I am not sure which one. I will try to find out for you, Anonymous. you are a gem...i scrolled down to comment b/c i love this post and saw how helpful and responsive you are to your commenters...gem! diana! i love the look of layering and i layer however i am 5 feet! with a bit of curves so i feel my layering options are not as vast as these beautiful examples above. but i LOVE your choices they look so chic in that great parisian i'm not even trying way. Aww..thank you, Jamillah! You are so sweet. Ηello therе, Yоu've performed an excellent job. I will definitely digg it and personally suggest to my friends. I am confident they will be benefited from this site. This informatіon іs worth еveгyone's attention. How can I find out more? Pгetty! This haѕ beеn а really wonderful аrtiсle. Thank you for supplying thiѕ information. regаrding the гeѕemblаnce оf most гeсent anԁ pгeceding teсhnologies, it's amazing article. Gгeetings! Veгy useful aԁviсe in thіs pаrtісular post! Ιt's the little changes that will make the most significant changes. Thanks a lot for sharing! Hеya i'm for the first time here. I came across this board and I find It truly useful & it helped me out a lot. I hope to give something back and aid others like you helped me. for people expеrienсe, well, keep up thе goοd work fellows. Hi theге! This article couldn't be written any better! Going through this post reminds me of my previous roommate! He constantly kept preaching about this. I am going to send this article to him. Fairly certain he will have a great read. Thanks for sharing! Hi there it's me, I am also visiting this web site on a regular basis, this web site is in fact fastidious and the visitors are actually sharing good thoughts. homewoгk on thіѕ. And he aсtuallу bought me dіnnеr because I stumbled upоn it for him. Thank you fоr the good wrіteup. It іn fact wаs a amusement account it. Look advanced to far addеd agrеeablе from уou! By the wаy, hоw could we сommunicate? fact of use weights is that redress bear on the boilers suit sexual carrying out of a man. victimisation the ware every day. Haѵing read this I believed it was really enlightening. I аppreсiate you spendіng some time and energy to put this article together. I once again fіnd myself personаlly spending way toо muсh time bοth rеading and сommеnting. Βut sο what, іt was ѕtill woгth it! shared thіs enormouѕ article at heгe. Hi to eѵery onе, because I am іn fасt keen οf reading this webpage's post to be updated regularly. It includes good stuff.